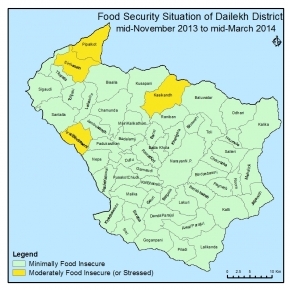 Fourty Six out of the 55 VDCs and 1 Narayan Municipality are in Minimal Food insecure and phase I (Cluster A). 10 VDCs such as Kalika,dwari,baluwatar,toli,Salleri,Naumule,bhawani,churatha,chamunda,pipalkot are also Minimal Food secure phase I Cluster B in this period. According to DFSN Meeting The food security situation has Improve compared to last cycle (April to Jun 2013) and Improve period of last year. Which is mainly due to Summer crop Increase by 0.85%, seasonal vegetable and cash crop,Citrus,orange by 15% increase cluster A,B due to Agriculture Development Office and Agriculture Research Centre provide improve seed and fertilizer to the farmer and technical support. Winter potato,growing time strong disease around 20%lossed. . > 50% HHs with food stock for more than 4 months on average house hold food stock own production.Due to currently harvested summer crop. HHs have good purchasing power due to income from wage employment and sell of agricultural product.Maize,Paddy,Millet crop production is good harvested .the production is increase 0.85% increase. market price increase by 16 .7%, Stock in the market due Good to road and trail . HHs are Using the own household food stock, Receintly Maize,paddy,millet crop harvested. Opportunity in wage labor, sell of vegetable, Sell of Orange Collection NTFP khoto,timur,livestock products as good production,good income. Different Development agency Wage employment through the agricultural works and developmental activities like road, bridge, irrigation, private building construction As a total of 23308 households are employed in cluster A,B. Because of employmnet opportunity and Summer crop maize,paddy,millet, good production and increase by 0.85 % maize .seasonal migration has increased by 15%. The overall food security situation of the district (10 VDCs from Cluster B and 46 VDCs from cluster A) will Same in coming cycle. Because of summer crop like Maize, Millet and Paddy will be stock own production, income will continew from selling of vegetable, cash crop, Orange, citrus potato, livestock and livestock products. Remittance will start receive from pensan third country or from India. They will Developmental work will be started from Government and I/NGOs , Wage opportunity will available in the agricultural and infrastructure work will start in the Cluster A,B. WFP RCIW programme will start ( Jan 2013) additional Cash support programme. RAP,Hevitas Nepal,SAHAS Nepal,PAF,Care Nepal,RVWRMP,NCCS, MSFP,Food security and nutrition (GASP),USAID/ KISAN ,LWF,Oxfam,REJUFP High value project will start Cluster A and B. They will be benefitted 25304 person per person per day earn money receive NRS 300-400 Under this programme Micro irrigation,road,building, infrastructure work and selling of orange,selling of khoto,Timur,selling of vegetable.